Neither are most of my windows cards they run circles around my MacPro. Thanks Paul. It was a quick image I grabbed for a torture test of luminosity and color range masks in both C1 and LR. Turned out to be a good test for Topaz too. I guess I’m a little forgiving on the speed issue. I agree it would be quite annoying if I had to sit and watch it. Thanks for sharing these interesting results. Which again shows that also code optimization can make a significant difference with these calculation intensive procedures. That might also mean that improvements can be made for the MAC (if OS restrictions can be circumvented). BTW, are you running Windows under Parallels on the MAC, or is it a dual boot system? I should have clarified, Sharpen on my Mac takes about 5 minutes on a 100MP or file or large multi segment D850 image. Focus or Stabilize are the ones that take so long to run, especially focus. I also agree with others that focus works very well depending the image, if there are areas that are smooth or lacking in detail, it tends to create a grid pattern or other type of strange pattern. My process times for a 16MP file on a straight-up WIN10 machine, with an EVGA GeForce GTX 960 2GB GPU, are similar to those you reported for WIN10. On another WIN10 machine with a more recent EVGA GeForce GTX 1060 6GB GPU, those times are reduced by about 35%. As noted in other comments, the Stabilize mode performs a more complex process than the Sharpen mode. In my limited testing so far, I've seen some cases where Stabilize seemed to extract more detail and texture than Sharpen, even on images of static subjects. Perhaps it was compensating for slight camera movement during handheld shots. But I've also seen examples where Stabilize performed worse than Sharpen on images where I thought motion blur would be present. The attached example was cropped from a small area of a shot made with a not-very-good zoom lens at 400mm. There are artifacts that look a bit like spatial ringing around the aircraft. Stabilize mode was set to (0.8, 0, 0), purposefully too high to make the artifacts more visible (although JPG conversion adds fuzz). On images with more complex backgrounds, such artifacts might not be as obvious, but they could create false detail. By the way, this is not a composite. 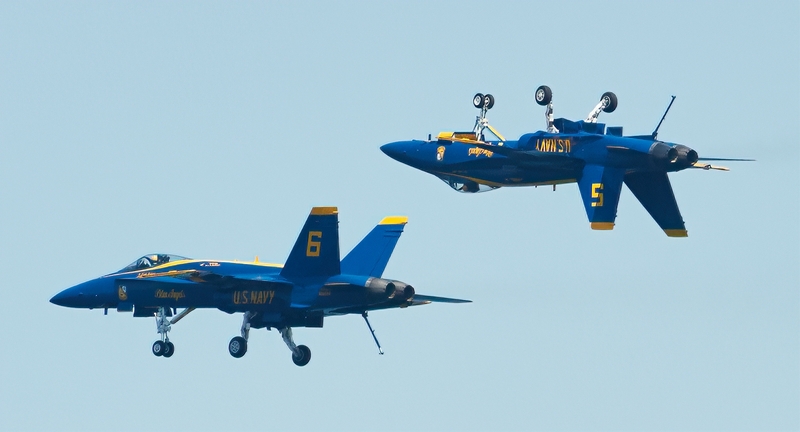 The Blue Angels really do this. Great picture, but why are they doing stunts with landing gear deployed? ... why are they doing stunts with landing gear deployed? That's not landing gear, that's spatial ringing, a sharpening artifact, false detail. Richard: Navy fighter jocks are trained to land on aircraft carriers, even at night, even in the presence of heaving seas. That requires precision flying with gear extended. I'm guessing this stunt is designed to showcase that skill. The attached image samples are taken from some tests that I ran today, comparing Topaz Sharpen AI with the deconvolution sharpening in Photoshop CS6 ACR. This is a reduced size JPEG of the whole image. The original is a full frame RAW file, captured with a Nikon D800E and Nikkor 24-70mm f/2.8G. This lens has significant field curvature at 24mm, and I suspect that's the reason why some areas of the frame are soft, even though the center is reasonably sharp. Here are the descriptions of the 100% crops, from left to right. The first was processed with no sharpening in ACR or Photoshop. 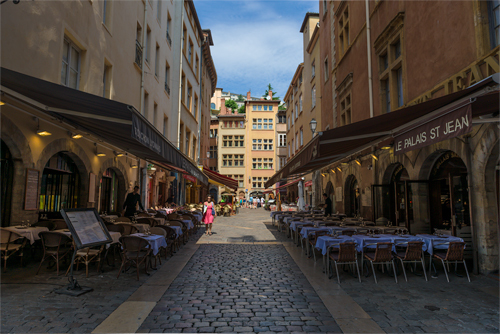 The second image was sharpened in ACR (35, 0.7, 100, 0). For the third one, no ACR sharpening, and Topaz Sharpen AI was used in Stabilize mode (0.4, 0.3, 0). The fourth one was converted in Capture One 12.0.2 with all sharpening disabled, and then exported to Photoshop, where it received the same treatment as the third image. I didn't attempt to perfectly match the tonal balance and colors of the third and fourth images - but there are other obvious differences. To my eyes, the Topaz software is extracting (or synthesizing?) image detail that I could not obtain with the sharpening tools in Photoshop and ACR. I did try other settings and other tools in the Adobe product. I am showing the results from the Stabilize mode in Topaz, because it produced a better result than the Sharpen and Focus modes, for this particular shot. Because Topaz Sharpen AI works in a different way than other methods, it might require changes to your workflow. I suspect that it may be wise to apply it after adjusting highlights, shadows, tones, colors, blurring, and noise reduction. Since the software employs pattern recognition, you want to prepare its input data so that the desired patterns are recognizable, and the undesired ones (e.g., noise) are attenuated. Topaz Sharpen AI is not a one-click panacea. It may take some trial-and-error to find the appropriate mode and settings for an image. Like any sharpening tool, bad settings can produce artifacts and ugly, crunchy results. It won't save shots that have tragic levels of blur. Masking may still be needed to control the level of correction in different areas of the frame. But I am finding that, on some images, this product can produce remarkable improvements. Indeed, it can be worthwhile to test Stabilize mode, because it seems to pick up asymmetrical (non-isotropic) blur a bit better. Whether that blur originated from motion- of lens distortion, Sharpen AI doesn't really care. Yes, that's also a new angle to Capture sharpening that has occured to me. Because Deconvolution does best with the as-Raw-as-possible image data, in as many bits precision as possible, also for the subsequent calculations, we want to do it early in the process. But with Sharpen AI we may employ a different strategy. I'm not sure, but I get a feeling that "selective sharpening" is on the agenda of the folks at TopazLabs. There appears to be a significant difference between the third and fourth crops, where the only difference is the raw converter, ACR v. C1, and the TIFFs were exported without sharpening. One would not expect a difference, but it's possible that C1 is still sharpening the exported file, even when you disable sharpening. When I exported from C1, I used a Process Recipe with sharpening set to "Disable All", because I wanted to isolate the effects of Topaz Sharpen AI. However, some people have noticed that C1 seems to produce a sharper output from its demosaicing process than Adobe's. That effect is probably not disabled in the Process Recipe. That's correct. Capture One often produces somewhat higher resolution output, with fewer artifacts. That is even the case when "Diffraction Correction" is not enabled. After a dozen emails over two years I continue to be scrooged: Clarity and now InFocus, the two plugins of theirs I use the most, don't upgrade to the new version for me, says I don't own them when attempting to log in. I sent them everything, including credit card statements of the purchases, I never heard back. The mess created by their switch to Studio and different logins two years ago continues. Not a happy camper. Not using their new plugins. I feel scrooged, so not buying new ones either. I would strongly suggest you send in a new request. I have had a number of interactions with Topaz and they have always been responsive to the content of my request if not always the most efficient and rapid in their replies. My guess is that with all their new product introductions they are inundated. I had somewhat the same issue a few weeks ago, no indication of Sharpen AI being free if one has a license for In Focus. I also discovered that a couple of other Topaz plugins were no longer working. They were all listed on my Topaz account page, but for some reason In Focus didn't have a license number attached. I emailed Topaz with the issues and within a week ai had a reply with a direct link to Sharpen AI and also download links to the other two that weren't working. They suggested that I download the others again and reinstall, which I did and they're working fine now. IMPORTANT: When I sent the original email I also included my License number for In Focus, which turned out to be very useful. I would suggest perhaps you should follow this procedure. Topaz has always answered any emails I've sent and always fixed any issues I've had. How long ago did you send in the request? I had a similar problem recently and also sent in a request to take care of it. It took about a week and half, but they did get back to me and resolved it; as well as apologized for the delay, which they said is due to being overwhelmed with customer requests related to the new AI products.